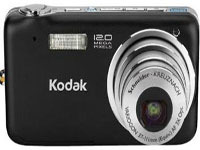 Kodak EasyShare V1233 Zoom Digital Camera Software Driver and Firmware for Operating Systems. This firmware version provides the following improvements: faster click-to-click time; faster time to display quickview; video image quality in the HD (high-definition) setting; defaults to HD HQ (high-quality) in Video mode when using a memory card. KODAK EasyShare V1233 Mac Firmware – Download (10MB). Use the links on this page to download the latest version of Kodak v1233 drivers and Kodak v1233 firmware. , and filed under Digital Camera and tagged easyshare v1233 download, kodak v1233 camera, kodak v1233 driver, kodak v1233 firmware, kodak v1233 software, v1233.